The <em>Spirit of St. Louis</em> was lowered January 14, 2015 as part of the <em>Boeing Milestones of Flight Hall</em> renovation. Visitors can observe the Museum’s conservation staff while they clean and preserve the artifact. The Spirit of St. Louis was lowered January 14, 2015 as part of the Boeing Milestones of Flight Hall renovation. Visitors can observe the museum’s conservation staff while they clean and preserve the artifact. In January of 2015, the Ryan NYP Spirit of St. Louis was lowered to the ground to begin assessing it for conservation work. The "Spirit of St. Louis" was lowered to the floor of the Boeing Milestones of Flight Hall" on January 14, 2015 as part of the exhibition's renovation. Close-up of signatures etched onto the Ryan NYP Spirit of St. Louis. Detail of the "Spirit of St. Louis"
Close-up shot of the the Ryan NYP "Spirit of St. Louis." Ryan NYP Spirit of St. Louis on the floor of the Boeing Milestones of Flight Hall. Lindbergh's Spirit of St. Louis was installed in the North Hall of the Smithsonian Institution's Arts & Industries Building on May 13, 1928. It was suspended just above the exhibit cases and its popularity with the public brought new attention to aeronautical collection from Smithsonian leadership. Paul Garber, who collected the aircraft and most of the early aeronautical collectton, recalled years later that acquiring the Spirit of St. Louis was "the turning point," and it "gave a much greater breadth to the subject of aeronautics" within the Smithsonian Institution. Lindbergh wasn't the first to fly across the Atlantic. In fact, more than 100 people made the journey before him. But he was the first to do it solo. The crew of the NC-4, shown here, completed the flight successfully, reaching Plymouth, England via Lisbon, Portugal on May 31, 1919. Juan Trippe (left) and Charles A. Lindbergh standing in front of a Pan American Airways Fokker F.10 Trimotor. Lindbergh's famous flight highlighted the potential of long distance flight. Aircraft industry stocks rose in value and interest in commercial aviation skyrocketed in the United States. The Spirit of St. Louis had no windscreen. Lindbergh used a periscope on the left side of the aircraft to see ahead of him. One third of the U.S. population of 140,000,000 saw Lindbergh on his U.S. tour. This New York City ticker-tape parade honoring Charles Lindbergh on June 13, 1927 featured a float with a model of Lindbergh's Ryan NYP and the Eiffel Tower. During his famous flight, Lindbergh fought exhaustion for 33 and ½ hours, having been awake for the entire day before take-off from Roosevelt Field, Long Island. Nearly a thousand people assembled at Roosevelt Field to see Charles Lindbergh off on his historic flight. Underwood and Underwood. Charles Lindbergh's Spirit of St. Louis is suspended from the ceiling in the National Air and Space Museum's Boeing Milestones of Flight Hall. Portrait of Charles A. Lindbergh leaning from the cockpit window of his Ryan NYP Spirit of St. Louis before his solo flight from New York to Paris on May 20 - 21, 1927. Two flare tubes project from the underside of the Spirit of St. Louis that helped Charles Lindbergh land at night during his Latin American tour in late 1927 – early 1928. Spirit of St. Louis Missing "R"
Lindbergh's Spirit of St. Louis was missing an "R." It was swiped by souvenir seekers when Lindbergh landed in Paris. Marty Kelsey, host of STEM in 30, shares a GEEK Moment with a close look at Charles Lindbergh's aircraft, the "Spirit of St. Louis." For the first time in nearly 22 years, the Spirit of St. Louis is lowered onto the floor of the Boeing Milestones of Flight Hall. Charles Lindbergh's flight between New York and Paris was very long, risky, and physically demanding. Though he was not the first to cross the Atlantic, Lindbergh made the first solo nonstop transatlantic flight between two major cities. News spread quickly as Lindbergh's flight stunned and amazed people around the world. 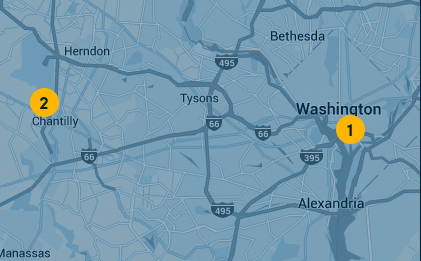 The flight highlighted the potential of long distance flight. Aircraft industry stocks rose in value and interest in commercial aviation skyrocketed in the United States. After his historic nonstop solo transatlantic flight, Charles Lindbergh took the aircraft first on a US tour and then on a goodwill flight to Central and South America. Flags of the countries he visited were painted on the cowling. Two flare tubes project from the underside of the Spirit that helped Lindbergh land at night during his Latin American tour in late 1927 – early 1928. A small fin and rudder made the Spirit of St. Louis unstable and hard to fly, which was intentional to help Lindbergh stay awake during his 33 1/2 hour flight across the Atlantic. One of the "R" emblems was swiped by souvenir seekers when Lindbergh landed in Paris. Spirit of St. Louis has no windscreen. Lindbergh used a periscope on the left side of the aircraft to see ahead of him. Silver colored doped fabric covered high wing single radial engine monoplane. 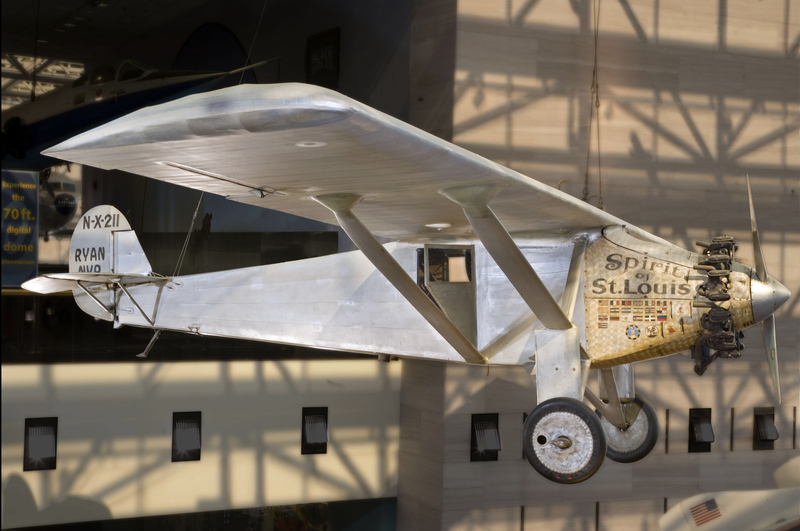 The "Spirit of St. Louis" was designed by Donald Hall under the direct supervision of Charles Lindbergh. It is a highly modified version of a conventional Ryan M-2 strut-braced monoplane, powered by a reliable 223hp Wright J-5C engine. Because the fuel tanks were located ahead of the cockpit for safety in case of an accident, Lindbergh could not see directly ahead, except by using a periscope on the left side or by turning the airplane and looking out a side window. The two tubes beneath the fuselage are flare dispensers that were installed for Lindbergh's flights to Latin America and the Caribbean. Charles Lindbergh received the Orteig Prize for his transatlantic flight. Orteig inspired the Ansari Prize, which motivated the SpaceShipOne team. Charles Lindbergh flew Spirit of St. Louis solo across the Atlantic & Tingmassartoq with wife Anne Morrow across Atlantic and Pacific to survey commercial airline routes. The original spinner nose that flew with the Spirit of St. Louis was signed by the men and women from Ryan Aircraft who helped manufacture the airplane.